Self Initiated Project, Research – Skyrim. Skyrim is an action role playing game and is the fifth installment in the elder scrolls series, it was developed by Bethesda game studios and is built on their own creation engine. It’s set in a vast open world with their own take on a Nordic/viking medieval fantasy setting, this is why I’m looking at it in my research, it will hopefully give me idea’s for my own environment i.e assets, architecture, style etc. 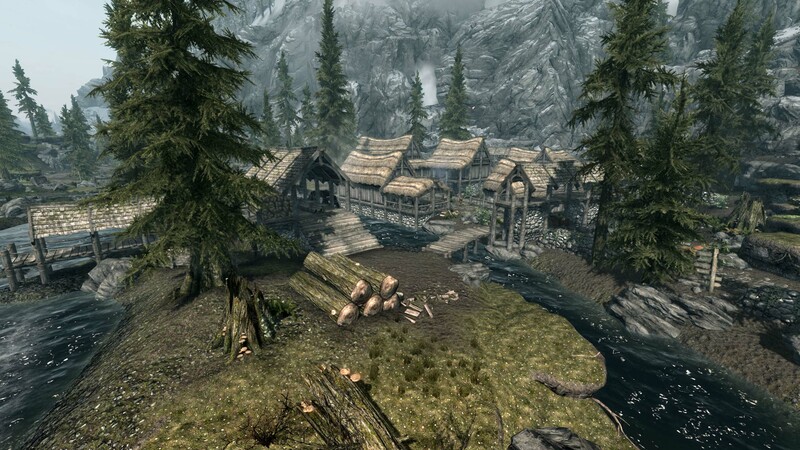 I’ve already put in excess of 100 hours playtime into the Xbox 360 version of Skyrim but haven’t played it for quite a while so I have been on it again recently looking around the towns and at the environment in much more detail then I previously would of. 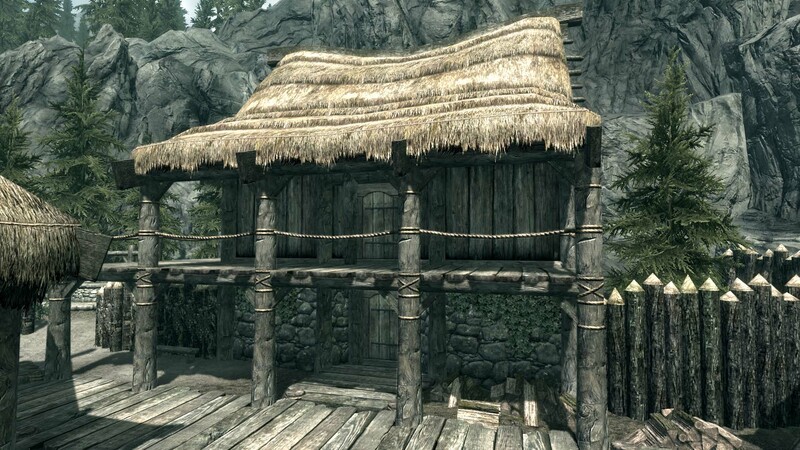 Riverwood is a small village situated in between a river and a mountain, it consists of a lumber mill, general store, blacksmiths, tavern, generic houses and farm houses. Most of the buildings are made up entirely of wood with straw roofs but there are a few stone structures as well, I assume the high use of wood will be because of the lumber mill in the town. I’ve highlighted the foliage in green to show its used quite a lot around the paths and on the walls, I’ve also highlighted some assets in red that I could implement into my environment, some I’d not really thought of like chopped wood. 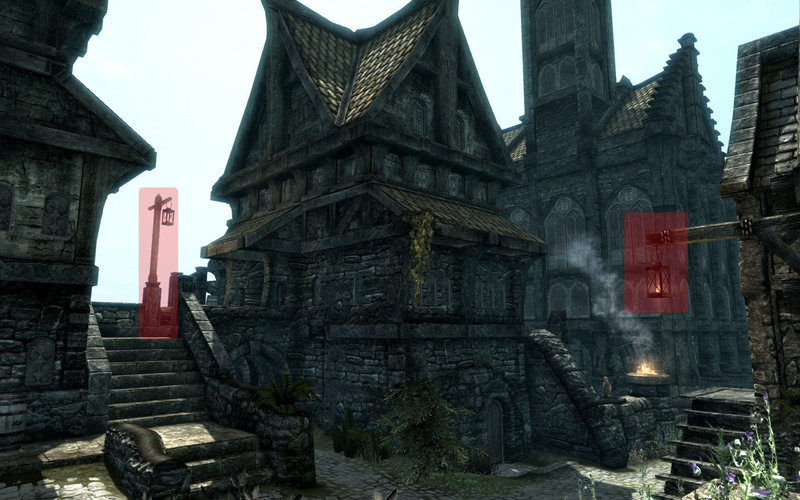 Falkreath is one of the major cities although it isn’t as big as some of the other cities. 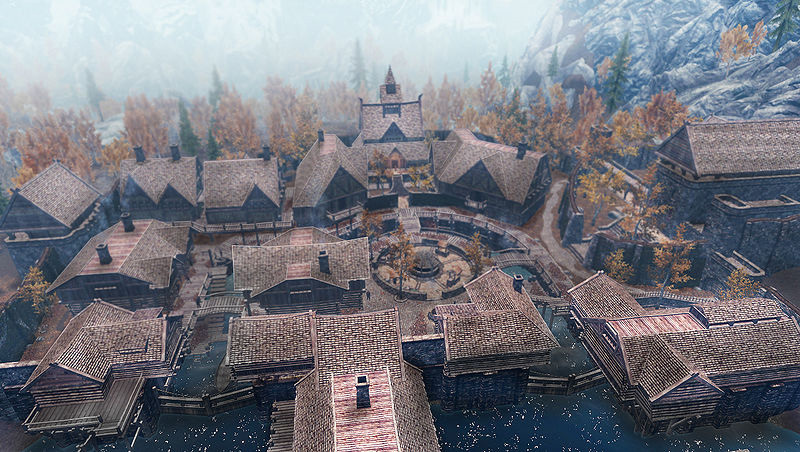 It has a lot of similarities to Riverwood and just looks like a larger version of it, the buildings are the same design and it also has a lumber mill, but there is a large town hall which is a differently designed building. 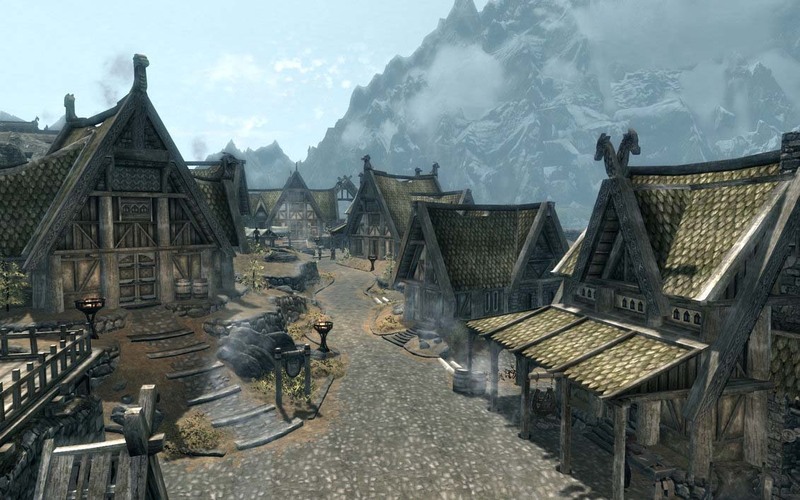 Whiterun is a large city and one of the main ones in the game as it is the first city you go to on the main quest line. The buildings are mainly made up of smooth stone and wood with Nordic patterns engraved, the roofs are tiled. 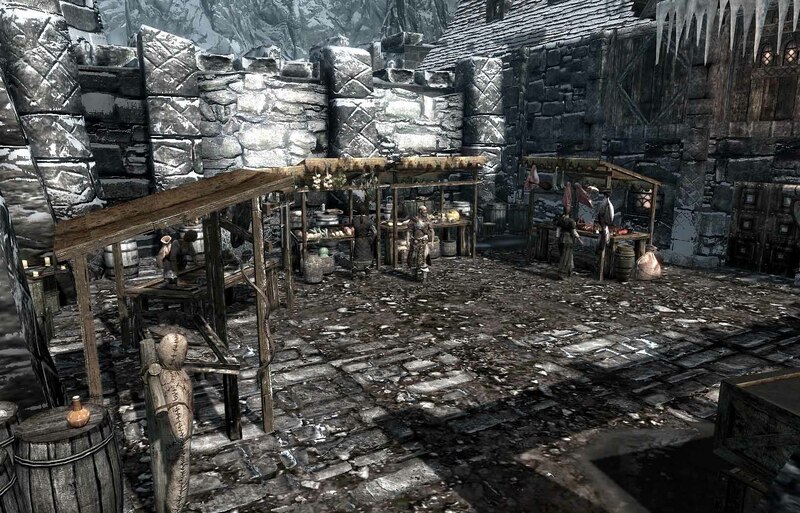 The market place in Whiterun was useful to look at because I plan to have a similar style market place in my environment, with the stalls and the well highlighted in red. I’ve also highlighted in blue the detailed architecture on some of the roofs. 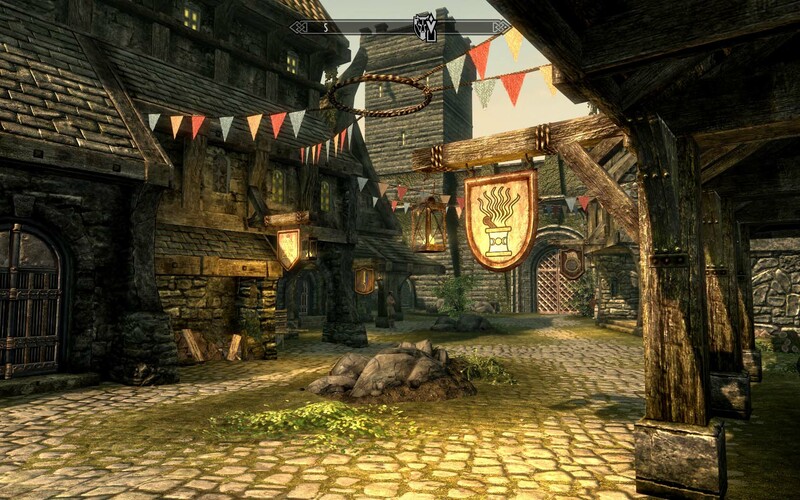 Dragon bridge is a small town and the buildings and architecture is very similar to Riverwood. 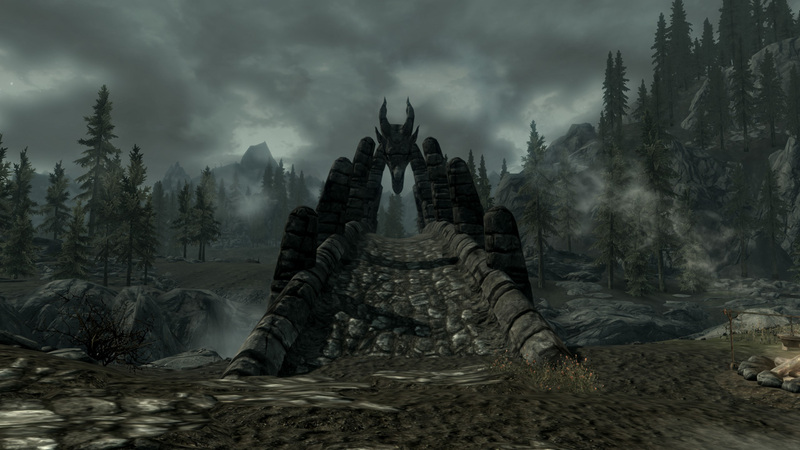 The most notable aspect of this village is the bridge which is elevated over a river and has a large stone dragon head in the middle, hence the name of the village. This is useful because I plan to have an elevated bridge in my environment, I was thinking of doing a wooden bridge though. 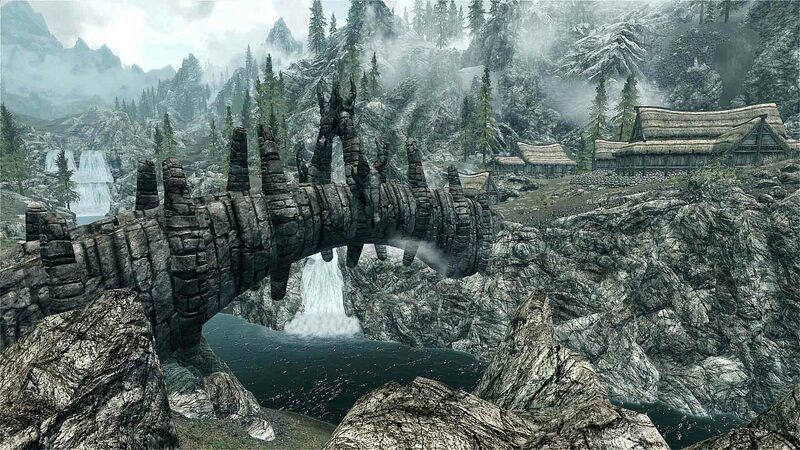 Solitude is a large city that is located on a large stone arch above a river. The buildings here look a lot different to other places, There are quite a lot of large structures that are mainly constructed of cobblestone with wooden beams and smooth stone beams. There are lanterns in this city instead of the usually fire pits in other cities, even though this is a built up city in a keep there is still a lot of foliage. 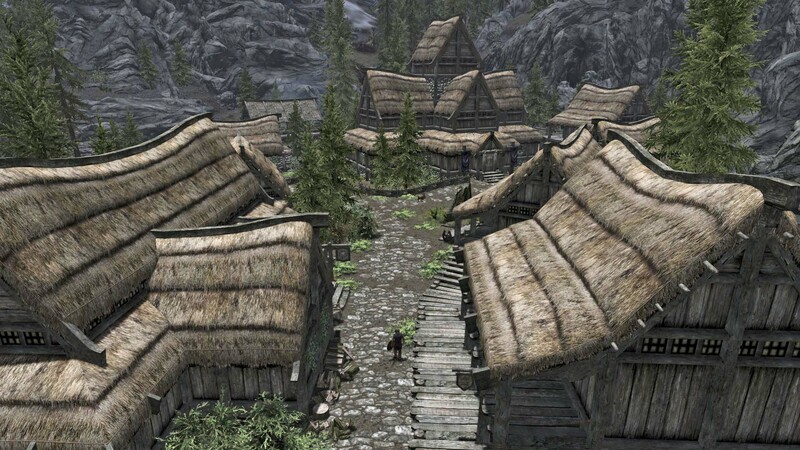 Riften is a main city and is built over part of a river so has many bridges and walk ways over the water. The cities architecture gives it more of a Victorian medieval feel then Nordic which is what it’s like in most cities. There is another market place here to look at as well as the elevated bridges. 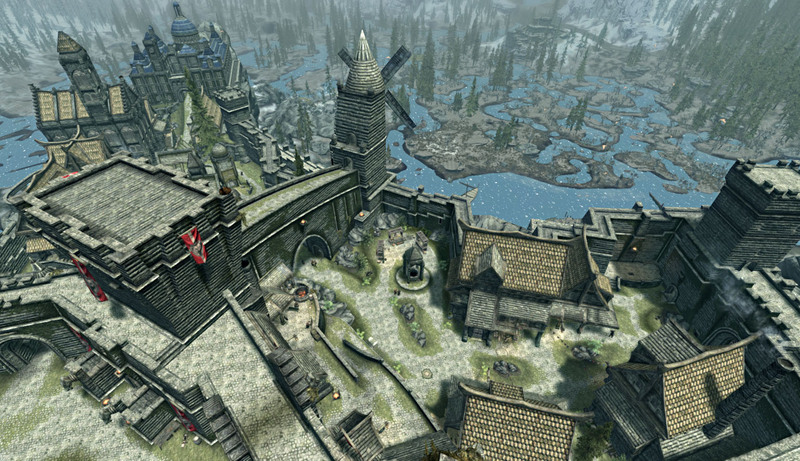 Windhelm is a city mainly made up of stone, it has many staircases because there are many different levels in the city, There is also another market place here. 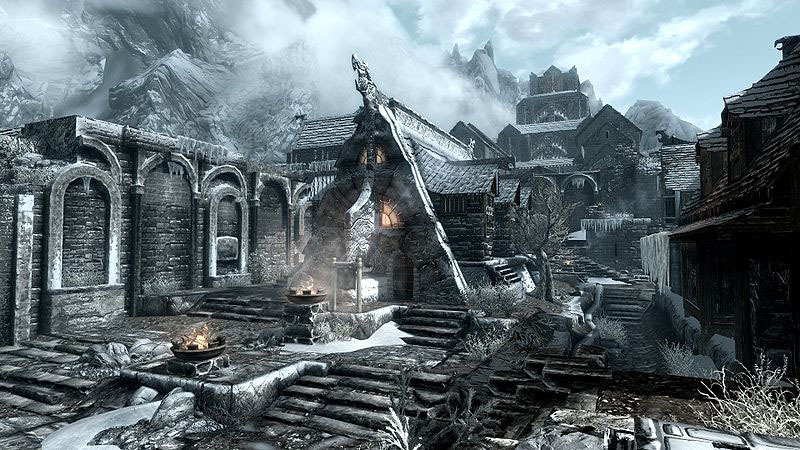 Whilst trying to find out who the environment artists where behind Skyrim I came across an article on Gamasutra called ‘Skyrim’s modular approach to level design‘ this was a presentation by Joel Burgess a senior designer at Bethesda game studios. The presentation is all about the modular kits used in Skyrim’s level design, to explain what a modular kit is he uses the pipe kit for an example saying the following. He goes on to speak about mixing and matching different kits to create more unique environments, he uses the dwarven dungeon’s as an example. To make sure that not every dwarven dungeon doesn’t look exactly the same the art team would mix the dwarven dungeon kit with another kit, he talks about using it with the ice cave kit to give the dungeon a different atmosphere. In the final part of the presentation he goes through the process of creating a kit and what each stage entails. This is useful for my project because I intend to create a modular kit for my buildings so this workflow will hopefully make it easier for me. it’s a very interesting presentation and I recommend anybody creating an environment to have a look at it.